PRICING IS PERSONAL – it all depends on what you want as a Consignor. Would you rather make money or never see the items back in your home again? 1.All items are priced in $0.50 increments and a minimum price of $1.00 per item. 2.Think about what you would be willing to pay for the item if you were in the buyer’s shoes. If you would pay a particular price, someone else probably would too! Ask yourself, “What would I pay for this?” Do some research on your product. 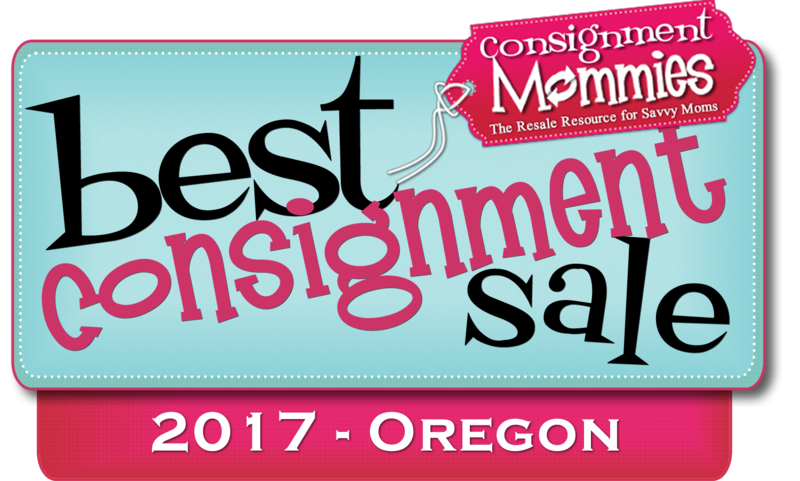 3.Check out online or Craigslist to see what the item is you want to sell is going for, then price accordingly! 4.Understand.. the Cleanest/GREAT condition items are what we want, take the TIME to make the most money you can off your items!! CLEAN and GREAT condition sell the BEST! 5.Take 30% of the original retail price and work up or down from there. This gives you a thinking range. If it is an item that is highly desirable like Abercrombie, Polo, Gymboree, Baby Lulu, Tommy Hilfiger, etc. you can go up from the 30% of original value, considering the condition of the item. If it is an item that is still in good shape, but from Target, Wal-Mart, etc. you might need to stay around that price. Please contact me here if you need further assistance. Help For You Busy Mamas! Are you slammed for time? We have help for YOU!!! There is an amazing tagging service NOW available!! SPACES are limited SO APPLY NOW!! Our VIP tagger is located in Portland and is willing to meet with you to exchange. Items need to be CLEAN and freshly laundered. For all games, toys, and puzzles, YOU need to check to make sure all pieces are present and accounted for. Please check with these ladies to see if there is still availability. We are SO excited to help those of you that need a little extra GRACE this season! Please watch the following video and then scroll down for instructions on printing tags. The tags need to be printed on WHITE CARDSTOCK and printed with BLACK INK ONLY!!! Since you are printing the barcode scan on the actual tag, (IN YOUR HOME) it is IMPERATIVE that you follow the instruction GUIDELINES, or you will be denied drop off of your items! 2. For MAC users: DON’T USE FIREFOX.. Change the “Scaling” to 95 percent instead of 100. Prints them perfectly on one sheet. 3. A laser printer is BEST!..IF YOU HAVE AN INKJET printer..set the printer on a lower ink setting, (draft) meaning not BOLD, 100%! Most standard settings are great. The lighter bar codes scanned perfectly! The heavy ink ones were much more difficult and had to be hand entered:(. Please help us as we are here to help you!! Print out one page of your tags and look at the barcode, is it really BOLD and fuzzy.. if so then choose another setting in the properties of your printer settings. 4. If you have been told your tags are not scanning.. everyone’s nightmare.. please know you will need to fix this for the next sale. 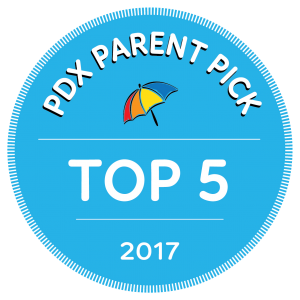 You can call me with any questions at 503-849-3308. WITH OUR NEW PARTIAL SORT, PLEASE THINK ABOUT PUTTING A STAMP ON THE BACK OF YOUR WHITE TAGS. Don’t use colored cardstock, as it may not scan, and the colored cardstock you see on the floor are for specific consignors who have EXTREMELY large volumes of clothin, adn it has been cleared with me. So white cardstock and a colored stamp or sticker on the back of the tag, not the front, to see your unsold items easily at pick up. 5. All clothing must be on hangers, plastic hangers, with the hanger facing to the left as illustrated. The best place to get FREE hangers is Kohls, Old Navy, Kmart, Fred Meyer, Outlet malls, etc..
6. Tagging gun/or/SAFETY PIN the corner of the tag into the garment’s left seam allowance. If its pants, see the placement of tag, in the picture above. NO STRAIGHT PINS!!!! 7. 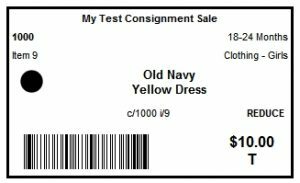 NOTE: If using a garment tagging gun…it is much faster than safety pins and works great for a large number of clothing items all at once. Be careful when using the tagging gun as it will leave a hole in the item. Tag into the garment’s seam, (NOTE TAG PLACEMENT ABOVE). I have tagging guns for purchase if you want one. I buy them locally they are $14.00 each and the barbs are .15cents for a rack of 50… please contact me. 8. Have these tags PLACED in the APPROPRIATE PLACE WE ASK YOU TO PLACE THEM AT OUR SALE!!. In other words, don’t hide the tag inside the clothes, we need to see it, to efficiently check people out! 9. When sizing your items, S, M, L, XL is only acceptable for MATERNITY. Children’s clothes should be sized with number sizes, i.e. 12 M, 2T, 5 etc. NOT S, M, L To reduce check in time. THIS MEANS YOU NEED TO KNOW THE ACTUAL # SIZE these XS SM MED LG XLG children’s items represent! 10. Books, please cover the barcode on the book with your consignor tag. Our scanners pick up those bar codes. 11. Please try NOT to put items in plastic Ziploc bags, (UNLESS you ABSOLUTELY have too) They don’t sell, shoppers want to see everything, and check items over for quality. 12. Toys MUST be working and BATTERIES in all items that take one. You can either tape the tag on the toy or tie a ribbon on the top and attach the tag to the ribbon, making sure NOT to cover your barcode so we can scan it quickly. 13. Blankets, Slings, Carriers, Shopping Cart covers can all be hung on tube hangers as we hang these items. 14. Again you NEED to have your clothing sorted by size and gender (rubber band sizes together). REMEMBER YOU WILL HAVE TO STAY AND SORT SIZES AND GENDERS IF YOU FAILED TO FOLLOW THE INSTRUCTIONS ABOVE! THIS MEANS 3MO: IS NOT 3-6MO; 3-9MO; 0-3 MO! ALL SIZES NEED TO BE SEPARATED! THIS MAKES Our drop off process seamless! and if you put your items in the wrong size it most likely won’t sell because shoppers are looking for the sizes they need, not going through every size section. 15. Tag Size/Example: NOTE! The BLACK DOT is NOT to be a hole punch for you to attach this tag to your items. It means DONATE!! If you punch this dot, all your items may be DONATED!!! 16. 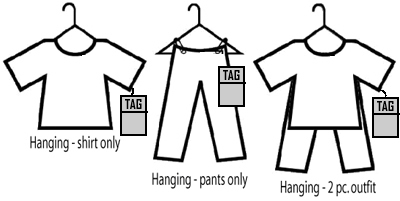 The tag should be approximately but NO SMALLER THAN 3 1/4″ by 1 3/4″. 10 tags per sheet!